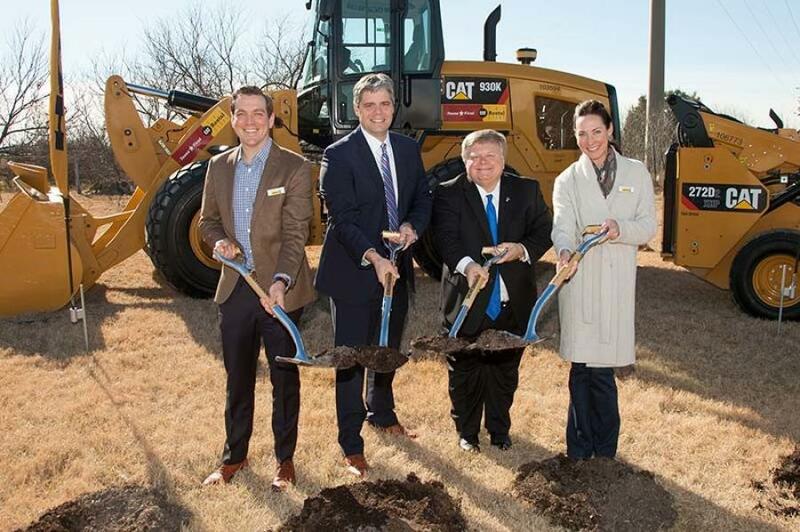 (L-R): Peter J. Holt, HOLT Cat CEO; David Morgan, Georgetown City manager; Dale Ross, mayor of Georgetown; and Corinna Holt Richter, HOLT Cat president and CAO, celebrate the groundbreaking. HOLT Cat, the Caterpillar equipment and engine dealer of south, central, north and northeast Texas, recently celebrated the groundbreaking of an 85,000-sq.-ft., full-service sales, rental and parts facility in Georgetown, Texas. Located off Airport Road, this new facility is a strategic move to better support its customers in the fast-developing central Texas region. HOLT Cat has been in the Greater Austin area since 1954, opening its first location on the iconic South Congress Avenue. It currently operates facilities in Austin and Pflugerville, off the I-35 corridor. HOLT Cat leaders Peter J. Holt and Corinna Holt Richter were joined by customers, partners and local representatives at the event, including Georgetown Mayor Dale Ross and City Manager David Morgan. “Georgetown is one of the fastest-growing cities, not just in Texas, but in the U.S. Investments in construction and infrastructure are driving demand for heavy equipment and services, and with this new location, we can better serve our customers in this region,” said Peter J. Holt, CEO and general manager. “[This] groundbreaking is especially exciting as we begin 2018, which marks HOLT Cat's 85th anniversary. As we reach this important milestone, we will continue to look for strategic opportunities to expand our offerings and services to our customers,” said Corinna Holt Richter, president and chief administrative officer. The Georgetown location will offer a comprehensive range of offerings for customers across the construction, industrial, oil and gas, and paving industries: everything from Cat machine sales, rentals, parts and service.